A toy not decorated with TV characters or bright colors? No blinking lights? No microchip? Nothing that wiggles or twinkles or giggles? Why would children want to play with something like that? And yet, they do. They play with blocks. Plain, wooden ones. 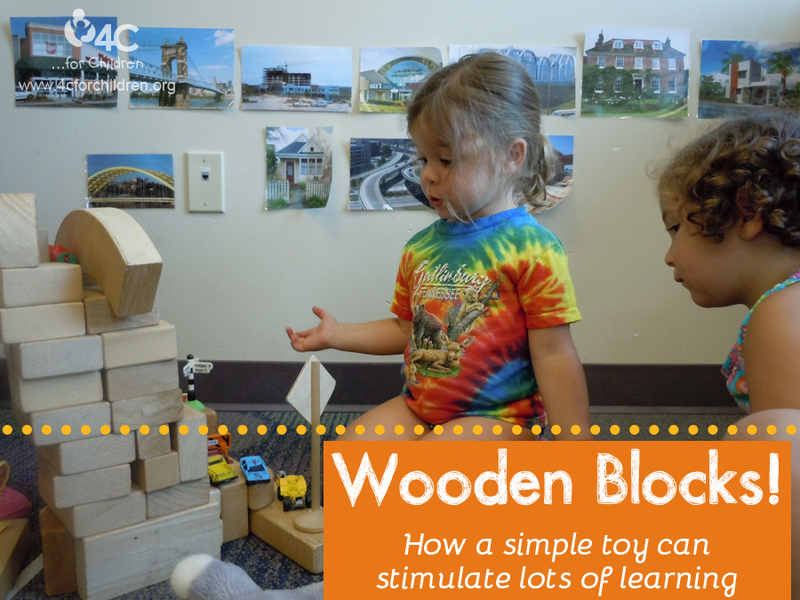 Many early childhood educators say wooden unit blocks are the one piece of classroom equipment they wouldn’t do without. For most children, playing with blocks is one of the benefits of attending school—complete sets are usually too expensive and large for home use. Talking about their structures stretches children’s language abilities. New words, like “trough and stall” are tossed back and forth with ease. And because it’s necessary, they find words to describe problems. They listen to each other’s suggestions. Clearly, conversation thrives in the block area. But talking isn’t the only way that blocks encourage language development. The barn made of blocks represents a real barn. It’s a child’s way of translating an idea into something visible, a symbol of a barn. Playing with blocks can help children strengthen their ability to use other symbol systems, too—such as written language. In fact, it’s not unusual for children to want written signs on their block buildings. Sometimes they invent their own, and other times seek an adult’s help. “Horse Barn, Cows Keep Out!” was the warning my children loved to print. In a world of plastics and other synthetics, children rarely have the opportunity to understand where their toys originated. Unit blocks, however, are made of wood. And wood, of course, comes from trees. It’s the kind of simple scientific fact that can be as amazing to a young child as, say, realizing that carrots grow in the ground or that hens lay eggs. Blocks also give children experience with scientific knowledge that’s more abstract. Remember that “slanty-thing” the horses needed for walking in and out of the barn? It’s a simple ramp, of course. But the concepts discovered while playing with a ramp aren’t nearly so simple. Like all block play, they include complex ideas like gravity, force, balance and energy. In a word: physics. What’s a child do when she runs out of the size block she needs to finish her horse’s stall? She can’t call up the block store and order more. What she does do is reach for another size, quickly realizing that two half blocks are the same length as four quarter ones. Like any competent builder, she’s working with counting, addition, measurement and, of course, fractions. The math learning doesn’t stop there, however. There are more geometric shapes—squares, rectangles, triangles, half-circles, and even cylinders. They give children a chance to experiment with part-whole relationships, and other important math concepts such as patterning, ordering and classifying. The next time the children in your classroom want to play with the wooden blocks, encourage and join in the fun! You’re looking at a set of learning tools that are simple, plain, and solid—but definitely powerful and open the door to learning. This entry was posted in Best Practice, learning through play and tagged wooden blocks on May 28, 2014 by 4cforchildren.